Mak Magic 2001 High Quality Classic! In all magic there is probably no sucker effect to compare with this splendid trick. There are several methods on the market having varied features, but we offer what we believe to be the finest and best outfit for packing the greatest effect. A hat or other container is placed on your table. 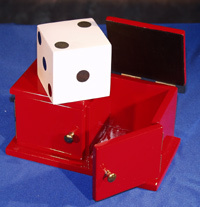 A solid wooden die is introduced, also a handsome red box having two compartments and four doors. These four doors are opened and with the audience looking in the front, the die is placed within the box. With the four doors open, the audience is given a view of the die inside the box. The magician now commands the die to leave the box, opening first one side, then the other, showing the box to be empty(?). The audience hears the die slide from one compartment to the other. After the usual by-play the magician shows the die has vanished and appeared back in the hat or container. Please note: this is not a double door die box. We accomplish the above effect with a very neat certain something.